If you’ve read one of my latest posts, you will know my dad always asks to eat at House of Prime Rib on his birthday. Well, in addition to that, he also asks to have a Napoleon cake. My mother and I usually never allow such fatty things in his diet, but this year we decided to give in. 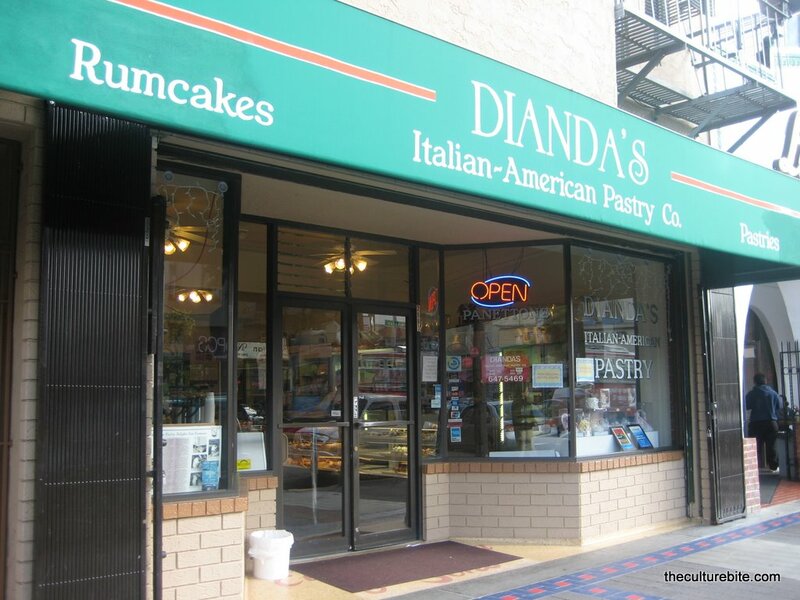 In the heart of the ghetto-est part of the Mission (the part no one wants to be caught in late at night) lies Dianda’s Italian-American Pastry Co. They’ve got an array of Italian pastries such as Napoleons, cannolis, sponge cakes and rum cake. Dianda’s is one of the few pastry shops in San Francisco that serves a Napoleon cake. Napoleon cake – If you haven’t had a Napoleon before, think of layers of buttery, crispy pastry with a thick custard in between each sheet. Dianda’s is known to have the best Napoleon cake in town. The cake is absolutely decadent. It does come with a heafty price tag though. The small cake (which serves 12-15 people) came out to $43 without tax. Make sure you eat the cake right away or else the pastry will soak up the moisture from the custard.